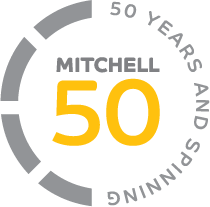 Mitchell celebrates 50 years of operations in the drilling industry. With improved market conditions and increasing rig utilisation, the Mitchell workforce grows to over 400 staff working throughout Australia. 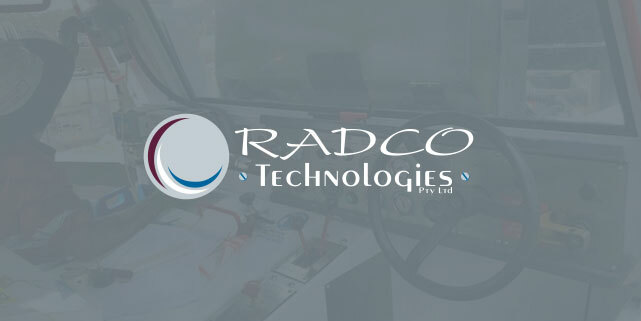 Radco Technologies is acquired to create an underground drilling division in the coal sector. Everyone in Mitchell Services, no matter their role, has a vital part to play in contributing to our success now and into the future. 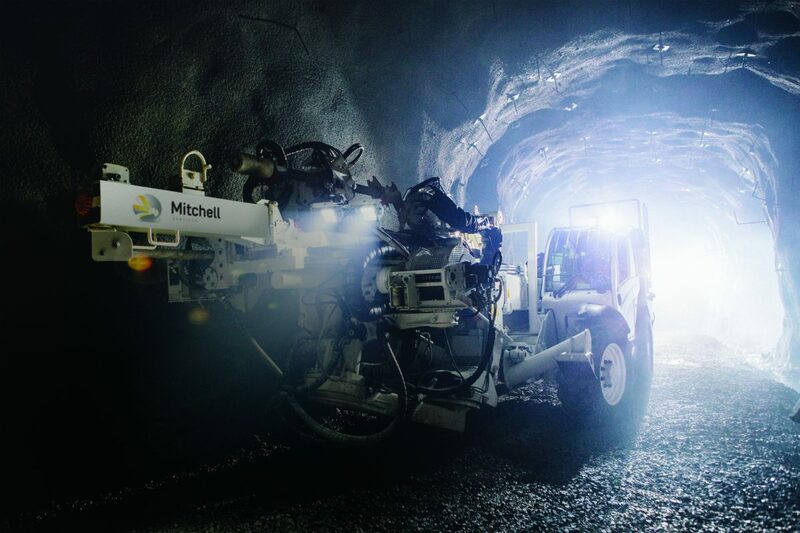 As part of a long term operational strategy, Mitchell creates and develops its underground minerals drilling business. New generation rigs adopting diamond rod handling and unattended auto drill functionality are acquired to service long term contracts for various tier one mining companies. Andrew Elf is appointed as Chief Executive Officer of Mitchell Services on 20 March 2014. He’s been with Mitchell since 2010. Mitchell Services pursues growth via acquisitions. In 2014, we acquire the assets from Tom Browne Drilling Services. Our fleet size increases to 50 rigs. 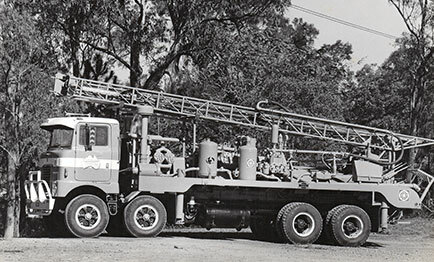 In 2015, Mitchell Services acquire Nitro Drilling, increasing our fleet to over 75 drill rigs. Drill Torque acquires Mitchell Services Pty Ltd to form Mitchell Services Limited. On 19 December 2013, the company’s ASX code becomes MSV. 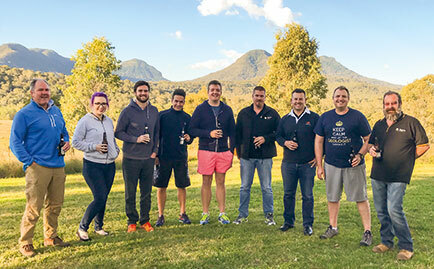 Mitchell Services Limited evolves from the merger of these two different businesses and pioneering families, who have specialised in various segments of the drilling market. The 5-year-non-complete period in Australia stimulates the development of our international business under Mitchell Group, headed by Nathan Mitchell. 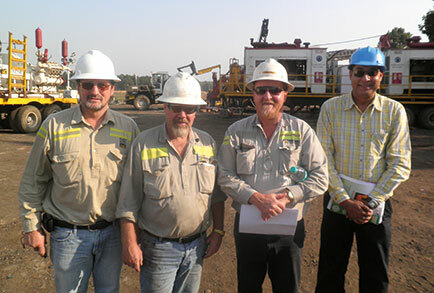 2008 – We start operations in Zambia with a large copper exploration program. Our Botswana operations begin with work on a key national energy project. 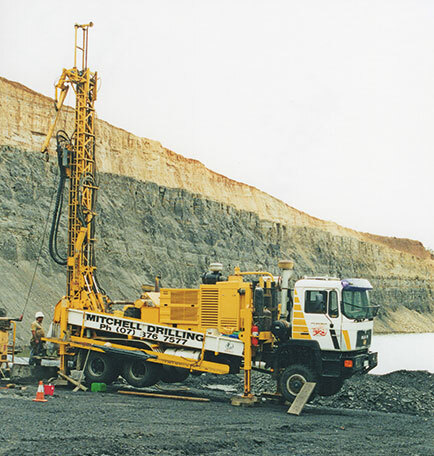 2010 – We start operations in Mozambique, drilling for coal and base metals. 2012 – Our operations in Russia start with a FEED study for a coal mine methane drainage program. 2013 – We complete the first CSG exploration well in Mozambique and the first SIS intersecting CSG well in Botswana. In 2003, we start operations in India, facilitating the creation of India’s CSG industry. We deliver the first commercial CSG production well in India’s history in 2005. In 2005, our US Operations begin, with Mitchell demonstrating its innovative coil tubing drilling method. Our China Operations start in 2005. We are a key contributor to the PRC State Special Safety Projects program for coal mine methane drainage. In 2006, Mitchell completes the first surface to inseam intersecting CSG well in China. Mitchell Drilling imports the first Soilmec rig into Australia. This is a game-changer for the company, putting us at the forefront of the emerging coal seam gas (CSG) industry in Australia. In 2001, we achieve the industry’s first surface-to-inseam intersecting CSG well. We brand our technique as Dymaxion drilling. 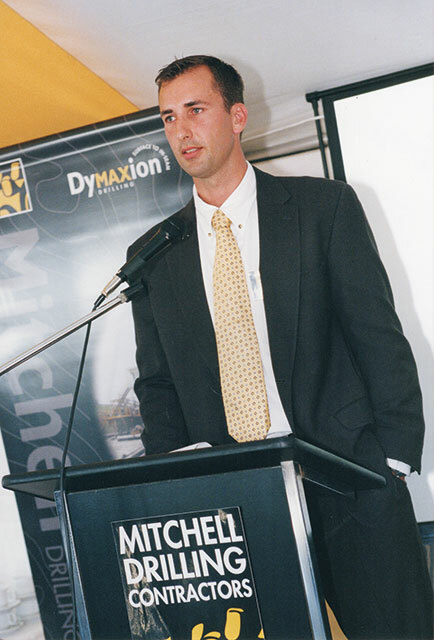 Nathan Mitchell takes the reins of Mitchell Drilling as the new CEO. One of the first things he does is create a new logo to take our company into the new millennium. We have 16 rigs and 80 people. At the end of the year, we prepare to move our headquarters from Benronalds Street, Seventeen Mile Rocks to our new office at the industrial estate in Darra. In October, the Mitchell Crew – John Box (Driller) and Andrew Wantsall (offsider) – head to Indonesia to drill for coal for BHP in the jungles of Balikpapan. Three months later they write a poem for The Mitchell Gazette about the challenges of getting to site to start work. He says “SKJ’s are the go”, we need to not know because 100,000 will give us the Go. We go down on the Wharf, containers are there of course. He’s clapping the F.M.C. skidder’s crackling. With our mobile phone attached to his crown. Let the Indos take care of it all. Reckon we are sorry the Indos had anything to do with it at all. “That Land Cruiser, she’s a mighty fine machine”. An illegal import of some sort, 100,000 RP should see it clean. Let’s hope we don’t see him again. Now the money situation’s looking a bit poor. Out came Ralphie with the Dough. The Land Cruiser takes a bit of a budge. Just got to get the gear to site. Because where have all the bridges gone? From fish heads, rice and goat – things must be a bit tight. That chicken in the tree should see us right. We should get to site some time. Mitchell Drilling begins work on a huge coal exploration program in Wyalong for Coal Operations Australia. Three Mitchell rigs are on this job. 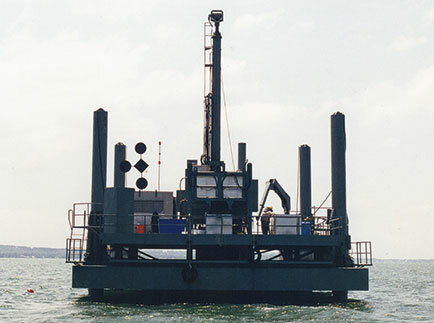 One is the platform-mounted rig on a barge which drills for coal 500 meters between Tuggerah Lake. 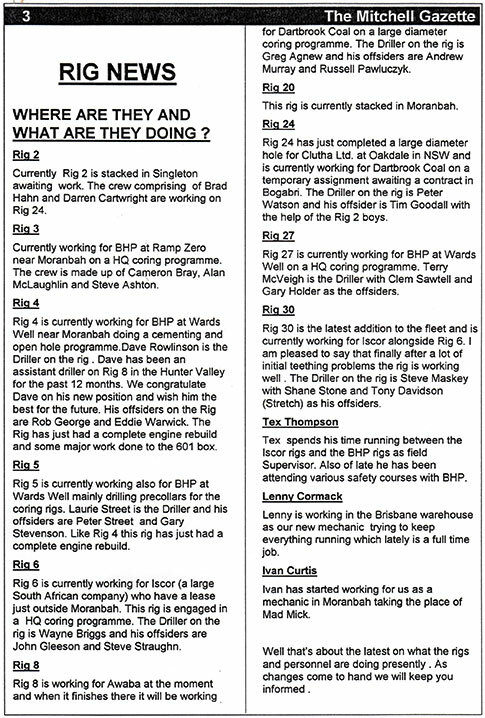 We have about 40 team members and 10 rigs. 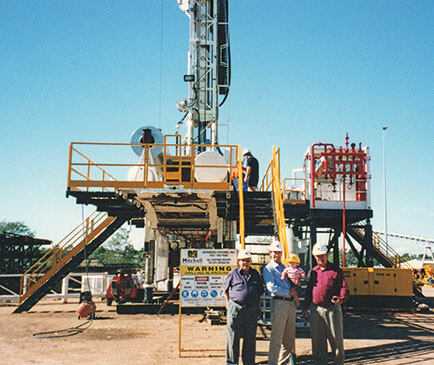 Our rigs include Bourne Kelly drive rigs, Universal Multi-Purpose rigs, specific purpose rigs working in New South Wales, Queensland and Papua New Guinea. Gary Woodall who started out with us in 1969 is now our Operations Manager. As a business, we always look to find a better way. To do this, we think outside the box and invent a lot of our own equipment. We design triple-tube core barrels, lift-go truck bodies and casing lifters. UDR invites the drilling operations around Australia to come to lunch. They ask what the drilling industry needs. Peter reckons that if UDR builds a multi-purpose rig (for big holes, small holes, air drilling, water bore drilling and core drilling) that he will buy it. 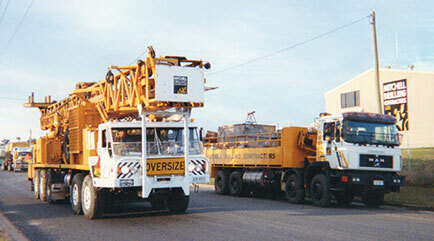 They do, and Peter buys the first UDR650 rig and brings it to Australia in 1987. Peter decides to build his own rig, and rig 6 is born. 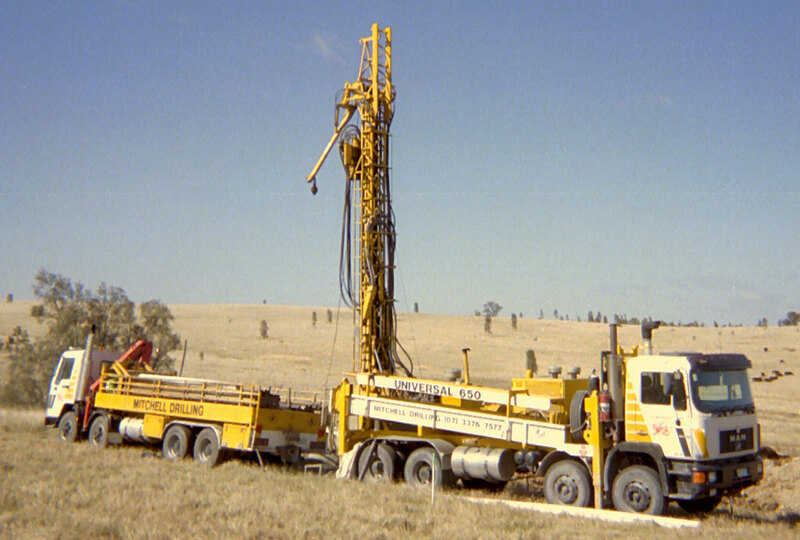 At first, it’s a Kelly drive rig and drills a lot of metres in coal and oil shale in NSW and QLD. 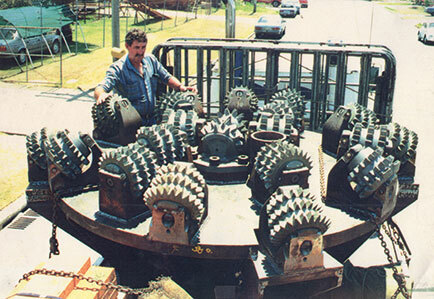 Later it is modified for RC Drilling. Investing in the latest equipment is a key part of how Peter and Dee build the business and stay ahead of their competitors. On the edge of the Gulf Country. And there they met the Gangers, there was Bill, Bob, Ben and Wazza. because they needed to cross the railway line to get to their next task. For once that bloody train is running right on time! For she was known in the drilling game as the big Bourne yellow pig. Wayne jumped in the Toyota and took off in a rush. A driller waving his hard hat – but wait – there’s two more. They’d got the rig off the tracks but they – er – weren’t very straight. And the one passenger on board – well he didn’t (hic) really mind! Peter’s motto in growing the business is “if it can’t be done, we will do it.” He’s prepared to go wherever there’s work, despite the logistical challenges of moving heavy equipment in extreme weather. 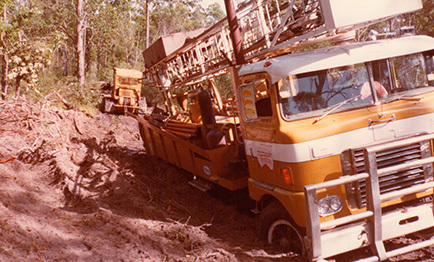 On 23 December 1974, Peter drives the rig out of Arnhem Land to go home to Brisbane. Just 36 hours later, on Christmas Eve, Cyclone Tracy hits Darwin. 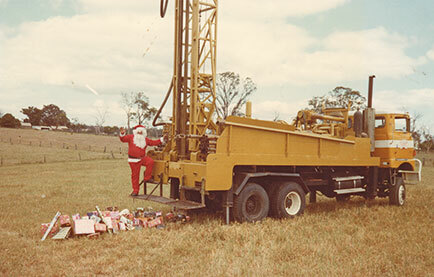 Mitchell Drilling starts drilling for coal in the Hunter Valley in 1974. Our work here continues until 2008. Peter gets a 4-month contract in Arnhem Land drilling for uranium. His base is an old mining camp called Elsharana, abandoned after World War 2. It’s hard to recruit a crew who go the distance in this wild country. Peter can’t see a long-term future in water bores – when it rains, farmers cancel the drilling work. So Mitchell Drilling expands into mineral exploration, drilling for Thiess Peabody Mitsui at Poitrel Station, west of Nebo, North Queensland. To set up camp, the first thing Peter does is drill two holes – one for the toilet, which is a piece of hessian strung around four star pickets and one for the washing machine. Then he digs mud-pits for drilling and an extra one for Dee, who is pregnant, to cool off in during the heat of the day. Dee is Mitchell Drilling’s all-rounder – secretary, accountant, camp cook and chief bottle washer. After baby Nathan is born, Dee runs Mitchell Drilling’s office from Brisbane. Peter decides to bite the bullet and go out on his own. On 27 June, Peter and Dee buy a rig, a second-hand Mayhew 1000. It costs about $11,500, their entire life savings as well as cashing in Dee’s superannuation. Mitchell Drilling is born. Peter starts drilling water bores for peanut farmers in and around Kingaroy. 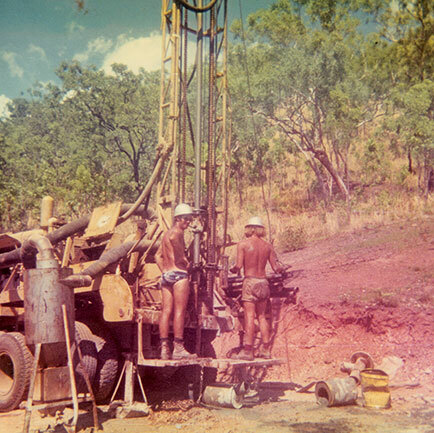 It’s 1962, the early days of the oil boom in Australia, when Peter Mitchell stars as a jug hustler doing seismic drilling for oil out at Blackall. After walking from Barcaldine to Mitchell and back, he works as an offsider with an international company exploring for coal. Whenever he gets a break he visits his twin sister in Brisbane – she flats with a bunch of good-looking girls. This is where he meets Deidre. 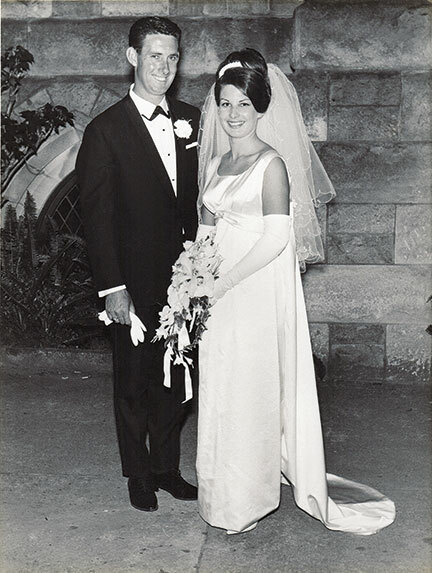 In 1966, Peter and Dee marry. 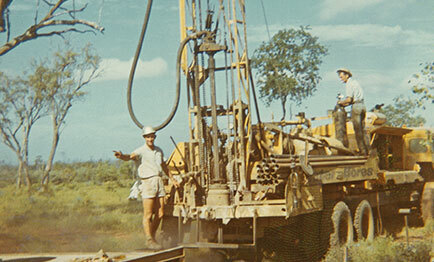 Peter gets a job in Brisbane with a drilling supply company as a field sales rep.